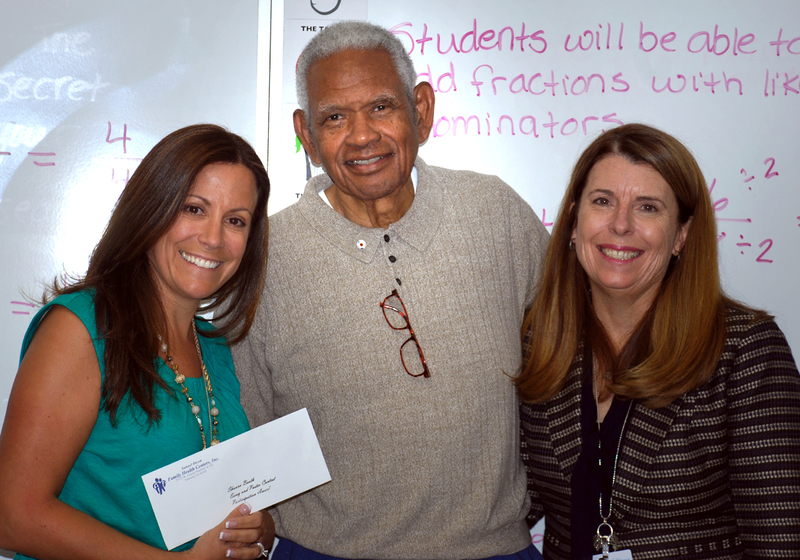 Ed “Papa Duck” Bolden (center) presents a check for a $200 classroom grant to James Foster Elementary School teacher Shauna Booth (left) with principal Dr. Deborah Bohn in attendance. Booth was the winning teacher in Samuel Dixon Family Health Centers’ annual rubber ducky school essay and poster contest. The Samuel Dixon Family Health Centers have announced the winners of the “Stay Healthy!” creative essay writing and poster contest from the 11th Annual Rubber Ducky Festival, held Oct. 5. Students from throughout the Santa Clarita Valley participated in the contest. One winner from each participating school was selected from a panel of judges to receive a commemorative certificate. Participating teachers were entered into a random drawing to receive a $200 classroom grant. Mrs. Shauna Booth, teacher at James Foster Elementary School in the Saugus Union School District, was selected to receive the grant. The annual Rubber Ducky Festival, also known as the Rubber Ducky Regatta, is SDFHC’s signature fundraising event providing patient care funding throughout the year. This year’s event raised more than $80,000 with all proceeds going toward patient care at SDFHC, which offers affordable, quality primary health care for residents of the Santa Clarita Valley. SDFHC makes a special effort to serve the uninsured and underinsured. SDFHC operates three health centers in the Santa Clarita Valley – Canyon Country Health Center, Val Verde Health Center, and Newhall Health Center – as well as outreach sites at College of the Canyons and California Institute of the Arts. SDFHC offers a full range of health care services – physicals, immunizations and vaccines, screenings and diagnostic tests, well baby care, and family planning. Patients pay based on their income. Congrats shauna.. Not everyone can write the creative essay writing, it needs talent. Monica Paul Tatlock I was laughing because I noticed that too! Thanks for sharing this nice post. The main steps in whole essay writing process are revising and proofreading. It is clear apparent that you have to consider so many factors before choosing an academic writing service. Essay writing reviews help you confidently decide which services are right for you in order to get best essay writing company.